The results from the initial clinical studies involving the microwave helmet Strokefinder confirm the usefulness of microwaves for rapid and accurate diagnosis of stroke patients. This is shown in a scientific article being published on June 16. Strokefinder enables earlier diagnosis than current methods, which improves the possibility to counteract brain damage. In the article, researchers from Chalmers University of Technology, Sahlgrenska Academy and Sahlgrenska University Hospital present results from the initial patient studies completed last year. The study included 45 patients, and the results show that the technique can with great certainty differentiate bleeding strokes from clot-induced strokes in patients with acute symptoms. 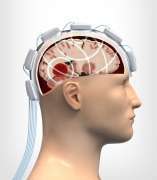 Strokefinder is placed on the patient's head where it examines the brain tissue by using microwaves. The signals are interpreted by the system to determine if the stroke is caused by a blood clot or bleeding. "The results of this study show that we will be able to increase the number of stroke patients who receive optimal treatment when the instrument makes a diagnosis already in the ambulance," says Mikael Persson, professor of biomedical engineering at Chalmers University of Technology. "The possibility to rule out bleeding already in the ambulance is a major achievement that will be of great benefit in acute stroke care. Equally exciting is the potential application in trauma care." 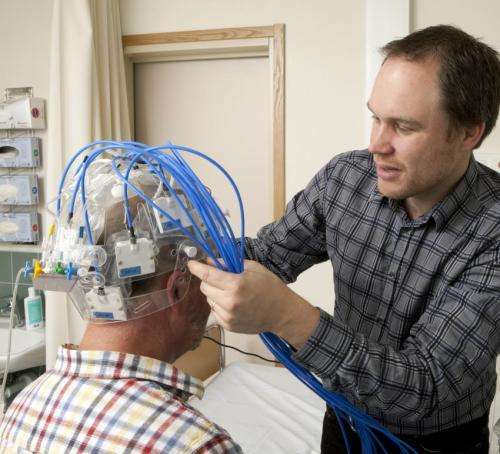 The initial patient studies have been performed inside hospitals, and this autumn the research groups at Chalmers and Sahlgrenska Academy will test a mobile stroke helmet on patients in ambulances. "Our goal with Strokefinder is to diagnose and initiate treatment of stroke patients already in the ambulance," says Mikael Elam, professor of clinical neurophysiology at Sahlgrenska University Hospital. "Since time is a critical factor for stroke treatment, the use of the instrument leads to patients suffering less extensive injury. This in turn can shorten the length of stay at hospitals and reduce the need for rehabilitation, thus providing a number of other positive consequences for both the patient and the health care system." Studies involving Strokefinder are currently being conducted in Sweden at Sahlgrenska University Hospital and Södra Älvsborg Hospital. The research is being conducted in close collaboration between Chalmers University of Technology, Sahlgrenska Academy, Sahlgrenska University Hospital, Södra Älvsborg Hospital and MedTech West, which is a platform for collaboration in medical device R&D, with premises at Sahlgrenska University Hospital. A new product, based on the results of the present study, has been developed, and further studies will be conducted in several countries in preparation for the CE approval that Medfield Diagnostics, a spin-off from Chalmers, expects to obtain later this year.